SuperBee was created to help our community go zero-waste and make a more positive impact on the earth. The environment and the community that our Wax Wraps were born in have had a direct effect on what we make, how we make it and who our business impacts. Based just outside the city of Chiang Mai, we’re surrounded by the forested mountains of northern Thailand. Known for its culture and history, Chiang Mai is also home to a very active eco-friendly, ‘slow life’ community and the city is absolutely buzzing with creativity. With all this nature and inspiration surrounding us, there’s no place we’d rather call home! 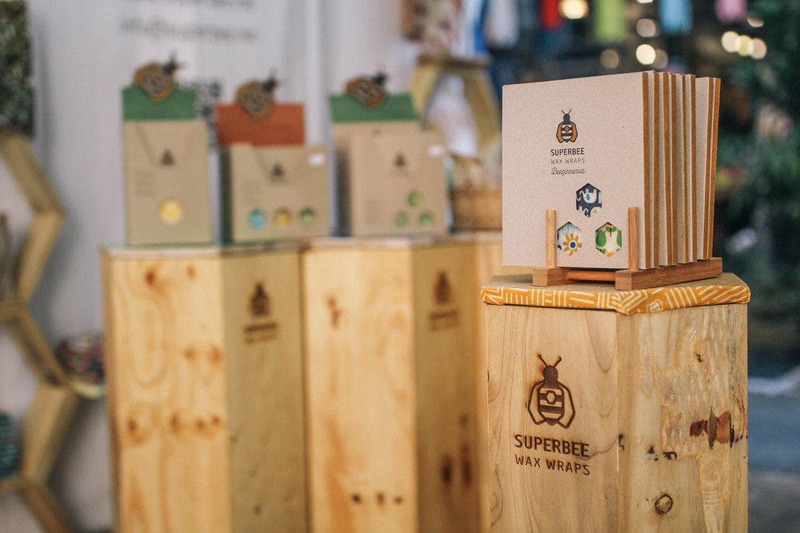 If you’re lucky enough to be in town, SuperBee Wax Wraps and other eco-friendly or zero-waste products can be found at a number of small retailers around town. Each of these creative shops and conscious cafes are well worth a visit! A specialty health food store which sells a wide variety of organic and natural products. Our bee-autiful natural hand-dyed indigo and ebony beeswax wraps made in collaboration with Studio Naenna can be found only in our online shop or at the Adorn with Studio Naenna shop right next to One Nimman. A cosy cafe and brunch spot which stocks a selection of natural products. A social enterprise cafe and zero-waste waste shop which supports a language and arts programme. An eclectic vintage, craft and eco shop. Our friend at Lanna Rhyme sells her finds at the Jing Jai Rustic Market on every Sunday and also has a shop called Duang Kam opposite Wat Dhap Phai on Singharat Road..
A popular vegetarian and vegan restaurant, vegan bakery and natural goods shop. A cafe known for baked goods and coffee, they also stock a selection of eco-friendly goods. A cafe and community space which also sells a variety of natural goods and eco-friendly products. A fun shop selling locally made, eco-friendly and healthy products on the CMU campus. The Pun Pun Organic Farm and Permaculture Center’s restaurant and shop which stocks a range of natural and eco-friendly products. A garden cafe and restaurant which also sells natural and organic goods, and eco-friendly products. A delightful family-run cafe whipping up Swiss treats! A popular breakfast spot for expats in Chiang Mai. When visiting the Royal Rose Garden (it’s home to 180 varieties of roses – just magical! ), you can also pick up some of our beeswax wraps. A health food store also stocking a range of natural goods and eco-friendly products. Fora Bee makes some of the highest quality beeswax and honey products around, so naturally were a git with SuperBee! You can pick up our wraps at their Saraphi Branch. Haven’t yet made it to Chiang Mai or didn’t have time while in town to visit these great shops and cafe? Not to worry, you can always shop online and get SuperBee products delivered with love and care from Chiang Mai, Thailand to wherever you are in the world! You can also search for brick and mortar retailers near you here.